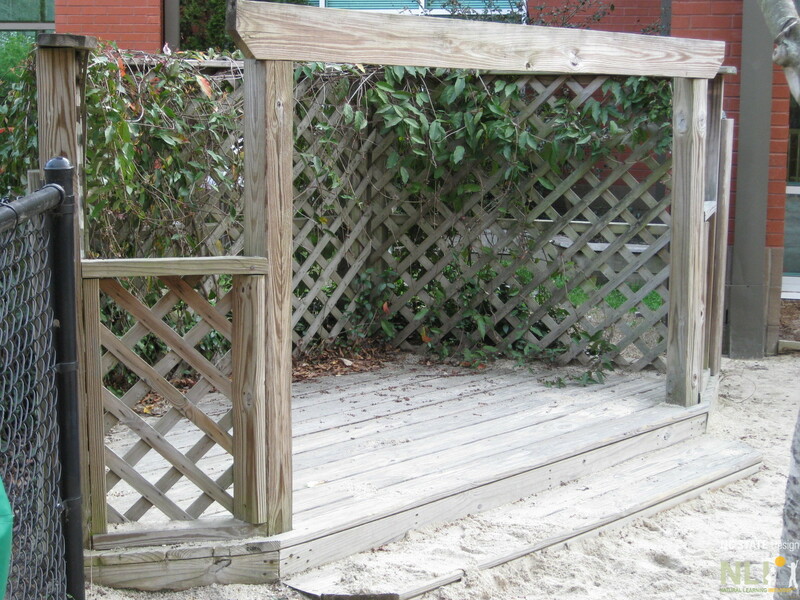 Is pressure treated wood acceptable for use in an outdoor learning environment? The first place to look for answers to this question is with local licensing and regulation agencies. If you are a childcare center seeking licensure by Division of Child Development and Early Education in North Carolina you can consult the state guidelines for outdoor learning environments, found here. You will find one reference to pressure treated wood, which will take you to the NC rules governing the sanitation of child care centers, which can be found here. (e) Decks, fences, playground equipment, and other products constructed or installed after September 1, 2006 shall not be made from chromated copper arsenate (CCA) pressure-treated wood unless the use of CCA-treated wood is for an approved use listed on the CCA product label and allowed under the US EPA Supplemental Guidance on Interpretation of Revised Chromated Copper Arsenate (CCA) Wood Preservative Label, as amended. shall be sealed using an oil-based, semi-transparent sealant; oil-based clear stain; or a water-based clear stain applied at least once every two years. On December 31, 2003, the U.S. Environmental Protection Agency issued a restriction on the use of Chromated Copper Arsenate (CCA) in the treatment of wood. Since that time, Alkaline Copper Quarternary (ACQ), has been the chemical used in preparation of pressure treated wood. Prior to the restriction of CCA the danger was in the leaching of arsenic into the soil and potential poisoning of plants or animals. The chemical that has been used since 2003, ACQ, is water based and does not contain the poisons that were present when CCA was used for treatment. Pressure treated wood should not be used where it is in direct contact with soil that will be used for growing vegetables or other edibles, as chemicals do still leach out into the soil. 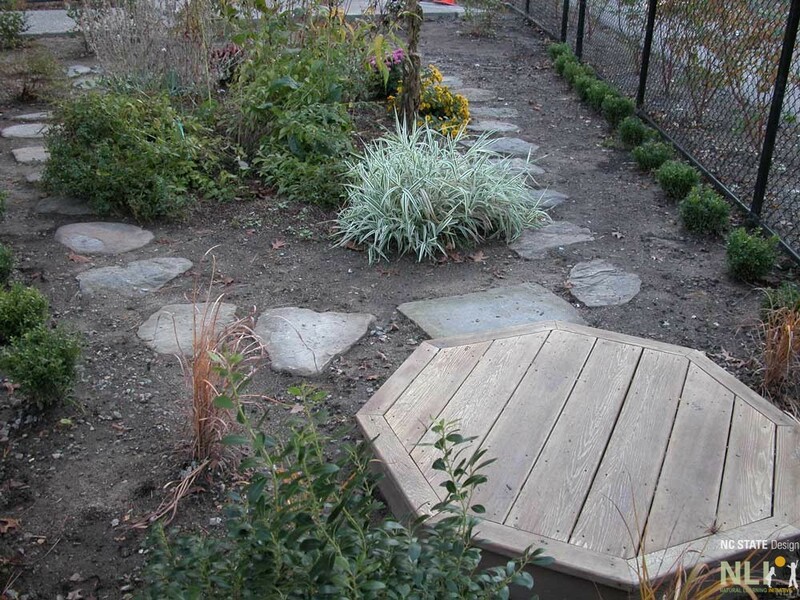 As a general rule, raised beds made from pressure treated wood should contain a plastic liner or other barrier between the wood and the soil. This will not only maintain peace of mind by eliminating the risk of chemical contamination in edible gardens, but also extend the life of the wood by reducing the amount of moisture around it. Other safety concerns over the use of pressure treated wood may be potential splintering, which can be eliminated with the use of quality materials and application of good craftsmanship. Pressure-treated wood is useful in many applications in children’s outdoor learning environments. A small deck made from pressure treated wood. 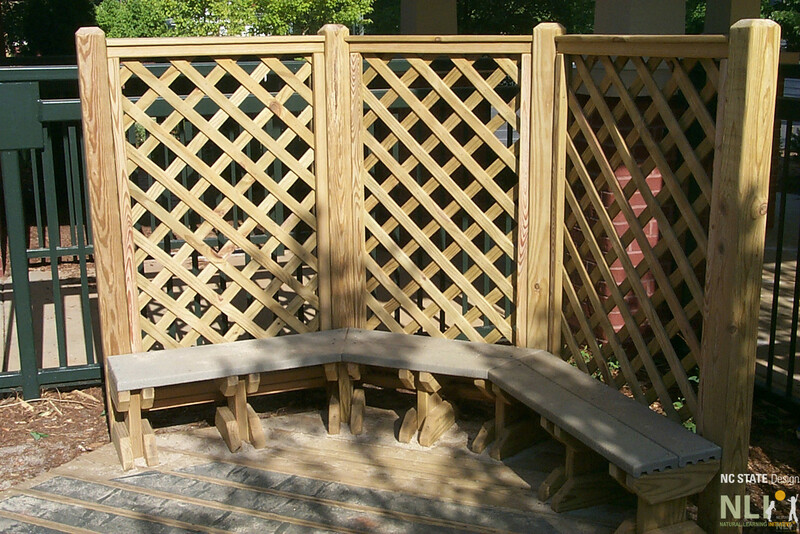 Benches and a trellis made from pressure treated wood. A stage with lattice backing made from pressure treated wood.